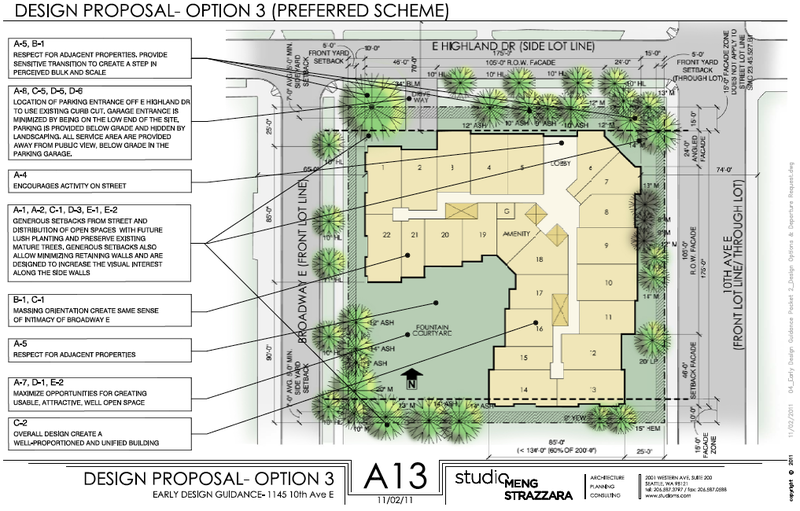 Two developments proposed to create multi-family housing on the edge of single family Capitol Hill neighborhoods come before the Capitol Hill Design Review Board this week. One gives us our first look at the plans for new apartments on 19th Ave E in an area where the change will likely be mostly welcomed. The other project makes its second session in front of the board after encountering stiff opposition from neighbors in its first review. And, by the way, the Capitol Hill board is looking for a new member. More on all, below. The first design review session for a Continental Properties apartment building at 1145 10th Ave E was brutal from a community relations standpoint. Neighbors — many from the tony Harvard & Highland townhome development across the street — came out in force to criticize the bulk and scale of the proposed 64,000 square foot, 76-unit, three-level wood frame over concrete building with 87 parking stalls. Oh, and a formal fountain plaza deck was in the plans, too. “As far as mass and footprint, it’s about three times anything in that area,” one resident said. 1. The current developer redesigns the project to comply precisely with the current codes, thus requesting no departures. This possibility, which results in very unattractive layouts with significant tree loss, is shown in Attachment D.
2. The current developer walks away from the property and a builder(s) purchase either some or all of the existing 50-foot lots. Attachment E shows the horrendous result—all of which is perfectly legal and has happened not only in our special neighborhood but all over the City. Aside from ugly buildings with no cohesive open space and multiple curb cuts for vehicle access/egress, virtually the entire buffer of existing tree canopy would be wiped out. (If you doubt whether this could happen, please think about this: any new builder/developer who looks at developing this property will now have the benefit of seeing the extent to which the current developer went in order to address neighborhood concerns, and he will surely conclude that it would be more sensible for him to avoid the DRB process altogether). 3. A non-profit organization (eg. St. Mark’s Cathedral) takes over the property and develops “social housing”—in which case, under the current zoning, they could develop over 100 units while supplying only about 70 off-street parking spaces. We’ll see if Kropinski’s support — and the plan revisions — will be enough to sway the board to give the project its blessing on Wednesday. 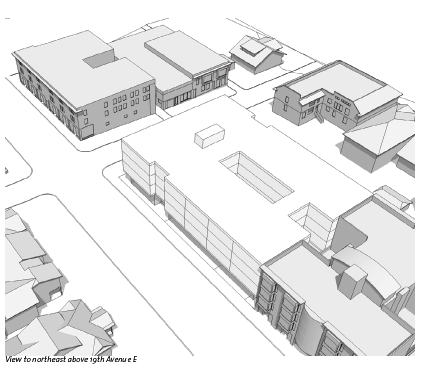 Less likely in need of letters of support is the plan to build a 40-foot building on 19th Ave E that will replace the homes of two-longtime Capitol Hill businesses -- the Holiday Craft Store and Capitol Hill Hair. The proposed project calls for an underground parking structure with 35 stalls, space for parking 14 cars on the surface, one level of street level commercial space, and approximately 50-apartment units above. Developer Lake Union Partners and architects Weinstein AU have been meeting with businesses and residents in the area about the project that will demolish two existing commercial structures and the large parking lot across the street from the Kingfish Cafe building. Capitol Hill needs a new "design professional" representative on its City of Seattle design review board. Information on applying is below. Evan Bourquard currently holds the position. His term expires in April, 2012. Mayor Mike McGinn is looking for qualified candidates to fill four upcoming openings on the city of Seattle's Design Review Board. The volunteer positions will be available April 4, 2012 when retiring board members' terms expire. Applications are due December 9, 2011. Application forms are available from www.seattle.gov/designreview or fromshelley.bolser@seattle.gov. The deadline for submitting an application is December 9, 2011. Prior experience with community or neighborhood groups is a plus. Board members must live in the city. The local residential interests representative must act as an ambassador to at least one community group or association (e.g. community council) that operates within the board district. Similarly, the local business interests representative must act as an ambassador to at least one business group or association (e.g. chamber of commerce) that operates within the board district. Acting as an ambassador may be easier for the board member if he or she lives or works within the district they are serving, but residency in a district is not a requirement to serve as a local representative. Board members should expect to work 12-14 hours a month attending and preparing for board meetings, which are held twice a month in the evenings. Board members are expected to attend at least 90 percent of the meetings. Applications will be accepted for positions other than those listed above and kept on file for consideration for future openings. 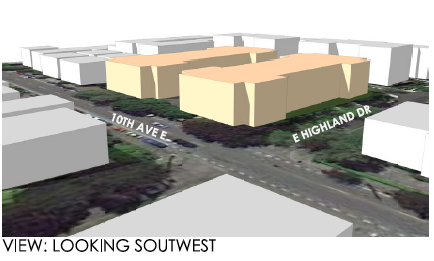 Regarding the 10th Ave E development, just about anything will be better than what’s there now, which is an underutilized parking lot used mainly by scofflaws (non-payers) for long-term storage of their derelict vehicles and by local residents who use it for free, off-street parking. That said, I hope the design will be as aesthetic as possible, and it’s a good thing the rich people in the Harvard/Highland condo (to the west) are on the case…such people have a way of getting what they want. Urban density is a good thing and this development will contribute to this goal. I thought I was going to see something that would overburden the view along 10th and Broadway. I see trees. For those interested in viewing the latest design plans and providing feedback on the proposed 19th and Mercer site development, there will be a public board meeting held this Wednesday, April 18th at 8pm at Seattle U’s Casey Building.